iRecruit is pleased to announce we have partnered with ZipRecruiter to help growing businesses hire, fast. iRecruit customers can now send send jobs to 100+ leading job boards with one click. 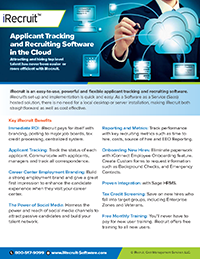 ZipRecruiter’s smart matching technology alerts quality candidates to apply by email, text or mobile app notifications. In fact, 80% of employers who post a job with ZipRecruiter get a quality candidate through the site within 24 hours. CMS Says: Congratulations on hitting the maximum number of hours (400) to qualify. Your actual credit may depend on the target group of employee. For example, if the employee was a SNAP (food stamp recipient), Designated Community Resident or Ex Felon, you qualify for a tax credit equal to 40% of $6,000 of first-year wages or $2,400…. For organizations struggling to compete for talent, background screening may seem like an unnecessary step in the recruitment process. In fact, 38% of companies are not screening for every position. Yet, background screening is a critical part of any talent acquisition strategy and helps companies improve quality and efficiency. It used to be that references only went one way–companies would call your former bosses, but you could never get a list of former employees that you could call to find out what the company is really like. Glassdoor changed all that. Now, you can easily find out what people are saying about any business. The talent shortage jumped from third to rst place as the emerging risk for organizations worldwide going into 2019, according to 137 senior executives in Gartner, Inc.’s latest Emerging Risks Survey. This entry was posted in Blog, iRecruit Blog and tagged #FridayReads, Recruiting News Roundup #FridayReads. Bookmark the permalink.